OTTAWA – Representatives from seniors’ groups and organizations for people with disabilities joined the Canadian Union of Postal Workers today to launch a major legal challenge to the attempt to end home mail delivery. “In Canada, people should count, not just the bottom line,” said Denis Lemelin, National President of the Canadian Union of Postal Workers. The union announced today that a challenge will be filed in the Federal Court of Canada under Canada’s Charter of Rights and Freedoms, asking the court to put a stop to Canada Post’s termination of home mail delivery. The challenge will also argue that this decision is beyond Canada Post’s authority and should be made by the Parliament of Canada which created Canada Post and defined its mandate. On December 11th, 2013, Canada Post announced that it would make Canada the only G8 country without home mail delivery. CEO Deepak Chopra’s bizarre statement that seniors would welcome the exercise of walking to collect their mail, as well as Canada Post’s subsequent requirement of a medical note to retain home delivery without any consultation with doctors has caused additional consternation. “This is one of the most important postal decisions which has ever been made since Canada Post was created in 1981,” said Paul Cavalluzzo, one of Canada’s foremost constitutional lawyers, who will be arguing the case on behalf of disabled and older Canadians. While the Conservatives have attempted to distance themselves from Canada Post’s decision, they are clearly backing the end of home delivery. Those who are filing the challenge say the Conservatives should be held accountable for ramming this through without proper consultation or debate. -30- For more information, please contact: Aalya Ahmad, CUPW Communications, 613-327-1177 or aahmad@cupw-sttp.org Carmela Hutchison, Disabled Women’s Network of Canada (DAWN-RAFH), carmela.hutchison@gmail.com . A rally was held in Toronto on Wednesday, October 8, 2014 to protest the impending changes to Canadian pensions. Hours later, the Second National Summit on Pension Reform took place inside the Arcadian; the summit was attended by representatives from Sun Life Financial, the Financial Sector Regulation and Policy (FSRP) Division of Alberta, Canada’s Public Policy Forum, Toronto Financial Services Alliance, and the Rotman International Centre for Pension Management, just to name a few; no aging Canadians or their representatives were asked to attend. Jean Claude Parrot, former National President of CUPW, gave a passionate speech outside of the Arcadian. He was joined by Jo-Ann Hannah, Director of Pensions and Benefits at Unifor National, President Herb John, and Canadian Labour Council President Hassan Yusseff. Supporters handed out petition flyers and information packages to passers-by, and many stopped to learn inquire about the summit, and how the potential changes to pension plans would affect their future. Herb John—President of NPF—Speech at Defend Our Pensions! Rally Jean Claude Parrot—Former National President of CUPW—Speech at Defend Our Pensions! 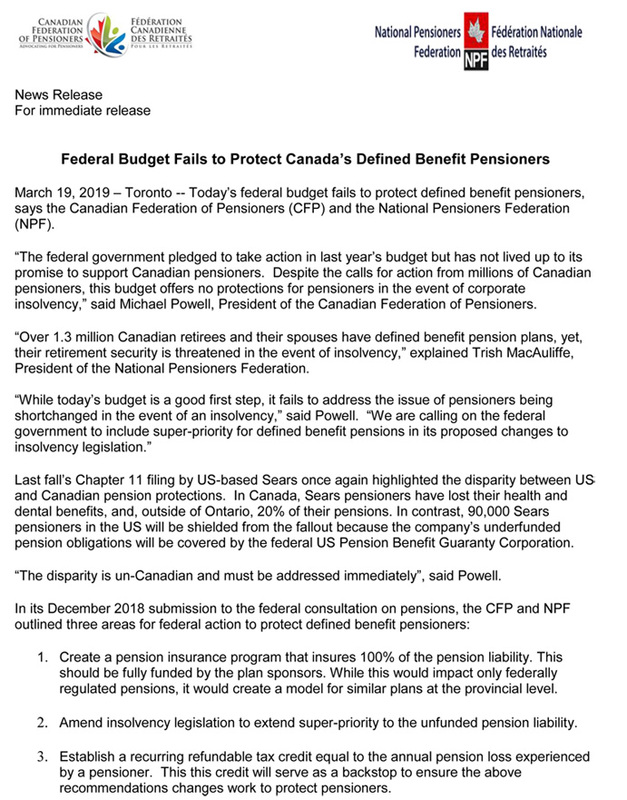 Rally Hassan Yussuff—President of the Canadian Labour Council—Speech at Defend Our Pensions! Rally Jo Ann Hannah—Director of Pensions and Benefits at Unifor National—Speech at Defend Our Pensions! Rally Videos Courtesy of Nadine MacKinnon. For more information on this issue, click here. The 70th annual National Pensioners Federation Convention took place on September 17 and 19, 2014 in Saskatoon, Saskatchewan. Members from across the country came out to take part in discussions on relevant political and cultural issues that pertain to Canadian citizens, and in particular to aging Canadians. Speakers included Adrienne Silnicki, Coordinator with the Canadian Health Coalition, Sheelah McLean, one of the founding members of Idle No More, Lynne Fernandez, the Errol Black Chair in Labour Issues with the Canadian Centre for Policy Alternatives in Manitoba, NDP Member of Parliament – Seniors Critic , Irene Mathyssen, Celia Sankar of Diversity Canada, and Garry Neil, Executive Director of the Council of Canadians. Yearly conventions are instrumental in continuing to organize, listen, and discuss in order to effectively advocate the principles held by the NPF. Some of the major issues brought forward by attendees included improving government legislation on health care by renegotiating a new Health Accord with the provinces and increasing the federal funding of provincial health care costs to 25%, a national pharmacare program, increases in CPP, OAS and GIS, protection of pension income, living wage discussions, poverty reductions and a national housing policy. NPF President Herb John would like to extend his thanks to all those who attended the convention, to the volunteers and committees that made the convention possible, in particular SSM for funding the very successful Meet and Greet, the Saskatoon Federation of Union Retirees for funding coffee and refreshments, and Pat Trask for providing delicious baked goods. A special thank you to Sheila Righi, who provided much leadership to the NPF, Saskatchewan Seniors Association Inc, and others for many years; to Fern Height and SSAI for hosting; and to Jean Simpson for her ongoing work with NPF newsletters, booklets, and documents. Sheelah McLean-Idle No More Sheelah McLean is one of four founders of Idle No More, one of the largest Indigenous mass movements in Canadian history. Along with the other founding members, she was listed in the 100 Leading Global Thinkers of 2013. The movement has pushed beyond the boundaries of our own countries, with demonstrations sparking up all over the globe including in Australia, the United States, and across Europe. Sheelah is a teacher and activist, currently living in Saskatchewan. Click Here to view the Power Point Presentation. Lynne Fernandez-Canadian Center for Policy Alternatives Lynne Fernandez is the Errol Black Chair in Labour Issues with the Canadian Centre for Policy Alternatives in Manitoba. She holds a Master’s degree in Economics from the University of Manitoba. Her interests lie in economic history, community economic development, government policy, as well as labour and environmental issues. Click Here to view the Power Point Presentation. Celia Sankar-Diversity Canada Celia Sankar is the founder of Diversity Canada. She has a Master’s Degree in International Journalism from City University of London, England, and has worked with BBC Radio, The Times and The Sunday Times of London, England, The Globe and Mail, The Vancouver Sun, The Victoria Times-Colonist and more. Diversity Canada strives to create, facilitate and promote opportunities for multi-ethnic, multi-cultural, differently-abled and diverse groups and individuals to participate in the economic, social, and cultural life of Canada and elsewhere. Adrienne Silnicki-Canadian Health Coalition Adrienne Silnicki is the Coordinator of the Canadian Health Coalition. Adrienne is a writer for rabble.ca and Canadian Perspectives, and is passionate about sustaining the conversation on health care issues in Canada in order to bring about change. Click Here to view the Power Point Presentation. Irene Mathyssen-NDP Irene Mathyssen has served as Member of Parliament for the riding of London-Fanshawe in Ontario since 2006. She was named the Official Opposition Critic for Seniors Issues, served as the Critic for the Status of Women, chair of the NDP’s women’s caucus and as the vice-chair of the Status of Women committee. Click Here to view the Power Point Presentation. Garry Neil-Council of Canadians Garry Neil is Executive Director of the Council of Canadians, Canada’s largest social justice organization. Garry is also the Executive Director of the Canadian Senior Artists’ Resource Network. He has written extensively about the negative impacts of economic globalization on world cultures.